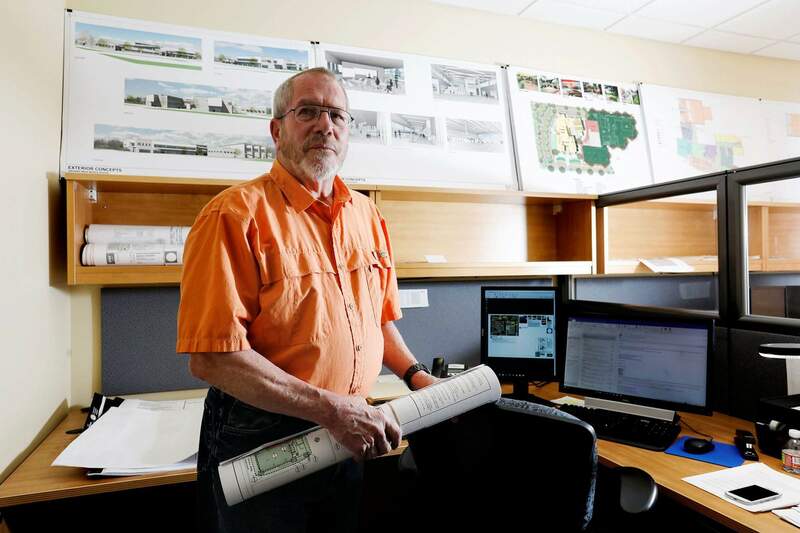 John Sisco, an architect with the Blythe Group + Co., works in his office in Grand Junction. For Sisco and his wife, their move to the Grand Valley was a win on two counts. GRAND JUNCTION (AP) – Architect John Sisco and his wife, Pam, are among the most recent arrivals to the Grand Valley in what some say appears to be a population boomlet unlike others that have preceded it. Formerly an Atlanta-area resident, Sisco was looking for a job and scored an interview with the Blythe Group + Co. firm in downtown Grand Junction. Sisco, who moved to Grand Junction in February, arrived on the heels of a population boost, a growth rate of 1.2 percent, or 1,822 people in 2017, according to the Colorado State Demography Office. What makes this growth phase different is that it seems to be built on more than geezers and gushers – retirees and energy workers. While the county population grew at that 1.2 percent clip, the valley’s labor force grew by 5.5 percent in 2017, from 70,288 to 74,198. The labor force continued to grow to 74,999 in March, and the unemployment rate tumbled, from 5.8 percent in January 2017 to 4.8 percent this January and to 4 percent in March. A growing labor force and falling unemployment rate suggests that newcomers are arriving, and finding work, Englehart said. “We’re seeing a lot of Front Range addresses” on job applications, he said. Likewise, said Nina Anderson of Express Employment Services in Grand Junction. “We’ve seen an uptick in the last six months, some professionals, bookkeepers, human resources and health care” as well as entry-level opportunities, Anderson said. “We’ve seen a marked increase in business,” said Duke Wortmann, a relocation consultant with Mesa Moving & Storage in Grand Junction and a city councilor. “We’re on pace certainly for a record year in my 28 years” with the company. For the Siscos, the Grand Valley is a win on two counts. It didn’t hurt that “I fell in love with the surroundings,” she said. To be sure, retirement is on the horizon, Sisco said, but he’s also a construction manager who’s experienced in dealing with significant jobs, such as School District 51’s projects due to begin this summer. His office is covered with plans and drawings for the 30 or so school-related projects that Sisco will oversee this summer. The drawback to Grand Junction so far is a lack of direct flights to various destinations, “but I’m sure in time that will happen,” Sisco said. Those 1,822 people who moved into Mesa County last year amounted to the 10th largest growth spurt among Colorado counties, and Mesa County’s net-migration figure of 1,506 was the ninth largest of any county in the state. Retirees, most of them from Denver, make up 50 percent of the buyers in the Copper Creek subdivision off 25 Road south of Patterson Road, developer Silas Colman said. Another significant chunk of buyers, 20 percent, are younger people with no children or very young ones, Colman said. “They’re not typically relocating, they already have a job here,” he said. Demand is healthy in Copper Creek, Colman said. His sister, Naomi, Copper Creek’s in-house sales representative, sold 40 houses in four months, he said. There is a mix of retirees and younger people, many from Denver and California, said greeters with Welcome Home, a greeting service for new arrivals in the Grand Valley. Greeters deal directly with new arrivals, offering information, and collecting some, during informal conversations. The apparent recovery fits into the Grand Valley’s general pattern of bust and boom, said John Wishart, owner of All Pro Moving. “Typically, it takes 10 years to recover from a disaster,” such as the recession that began in 2008, Wishart said. The turnaround is far from complete, though, Englehart said, noting that the labor force topped 80,000 before shrinking by 14,000 with the recession.